It’s Already Color of the Year Time! Time flies, doesn’t it? 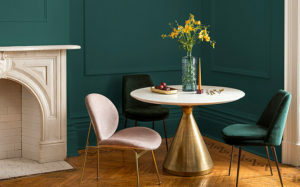 It became abundantly clear to me earlier this week when my inbox informed me that Sherwin-Williams was announcing the 2019 Color of the Year. 2019? Wasn’t is just 1987 last week? And didn’t I just write about the color of the year a month or two ago? No, it was actually February, when I talked about Ultra Violet (Now, THAT’S a color). That’s probably the color I should have painted the walls in the great room at the ranch, rather than the incredibly Caucasian Skin Tone shade I did use. It’s not brown; it’s not orange; it’s desert rock color. They are right that it can be used in a lot of settings and with a lot of styles. I like the idea of using it with natural leather and an unbleached linen kind of color. So, everyone run out and paint your rooms so you’ll be au courant! 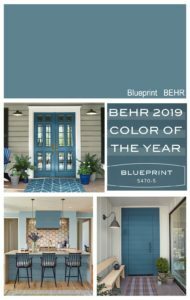 Sherwin-Williams is not the only company out there promoting a color for 2019. PPG also has one, and it’s more “exciting” (or in other words, mainly an accent color). Night Watch is a very dark green, and PPG says it’s the Power of Nature. It’s sort of spooky, but on the other hand, I’m fond of green, so I would not mind it one big lining the backs of shelves, or in a cozy library or office area. It’s a bluish green, so perhaps that makes it more trendy than an avocado shade that’s more yellowish. It sure looks pretty against white. from the Ace Hardware website. 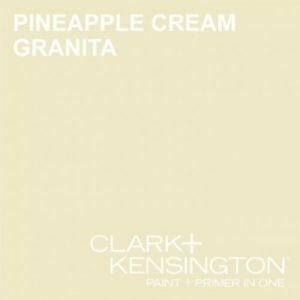 Ace Hardware’s Clark + Kensington line had a contest to where customers designed colors, and the winner came out to be a fairly perky creamy light tan called Pineapple Cream Granita. Nothing wrong with this color at all. At least it’s not so pale you can’t tell it’s a color, but still it’s pretty neutral. Not to be forgotten is Behr. I read an article last week calling their Blueprint color a true blue. It seems to me to be a little muted for that, but it’s not an awful cloying blue like so many are (to me, not the biggest fan of blue). It will make a nice accent that’s not screaming at you, like the doors in the picture at right. Inspired? I am. I pretty much want to pair that Pineapple Cream Granita color with everything! The best thing about all these colors is that they don’t look like they’ll age quickly. For example, I think I’d still enjoy a room in the clay color in a decade, since it’s drawn so closely from nature. Tell me, what’s your favorite? I love the darker colors…..I need new paint on my walls now. I like them, too, and expecially like them in a cozy bedroom, etc. I really like that Pineapple Cream color for the kitchen ceiling. It looks bright, sunny, and cheerful to me. Or it might make a nice accent color. I am looking at accent colors too. I do like Cavern Clay! That is a very warm color, and season neutral.